Last night for Sunday dinner, Bill slow cooked some roast beef in the oven. I poured a can of beef broth on top and added a little “Better Than Bullion” (great flavor with no MSG). We also put in some carrots, onions, garlic and celery for extra flavor. Then Bill made some mashed potatoes and broccoli…talk about comfort food. It was amazing. So now we have all of this leftover beef. That’s when I decided to try something new. Normally chimichangas are deep fried which makes them way too unhealthy and fattening. My version allows for a crispy exterior without the fat and calories. We love Mexican food so this is quite a treat. Add a salad and bam, dinner is done! So easy, quick and delicious…this is my kind of meal! Enriched Bleached Wheat Flour (Wheat Flour, Niacin, Reduced Iron, Thiamine Mononitrate, Riboflavin, Folic Acid), Water, Vegetable Shortening (Interesterified Soybean Oil, Hydrogenated Soybean Oil and/or Palm Oil), contains 2% or less of: Sugar, Salt, Leavening (Sodium Bicarbonate, Sodium Aluminum Sulfate, Corn Starch, Monocalcium Phosphate and/or Sodium Acid Pyrophosphate, Calcium Sulfate), Distilled Monoglycerides, Enzymes, Wheat Starch, Calcium Carbonate, Antioxidants (Tocopherols, Ascorbic Acid, Citric Acid), Cellulose Gum, Guar Gum, Calcium Propionate and Sorbic Acid (to preserve freshness), Dough Conditioners (Fumaric Acid, Sodium Metabisulfite and/or Mono- and Diglycerides). Once again, I have no idea what all of this stuff is. But I do know this…I’m not eating it and I’m not feeding it to my family. For years now I’ve been able to avoid these ingredients. Here’s what I do…I either buy flour tortillas at Trader Joes or I buy “Tortilla Land” brand that you cook yourself (from the refrigerator section). And guess what? There are only 5 ingredients: Wheat Flour, Water, Canola Oil, Salt and Sugar. Now, that’s more like it! This is funny…Bill made his own chimichanga with left-over mashed potatoes and the roast beef. Such a man meal and it was really good too! Sauté onion and green pepper in the coconut oil (or olive oil at a low temperature). Add garlic cloves and cook until everything is soft. Add meat of your choice as well as pan drippings or some chicken broth. Cook until meat is warm and liquid is almost gone. Pre-cook or warm flour tortillas (to soften for rolling). Spoon meat into tortilla. Add grated cheddar cheese and salsa (optional). Roll up “burrito” style. Place on a baking sheet sprayed with Pam. In microwave, melt butter together with olive oil. 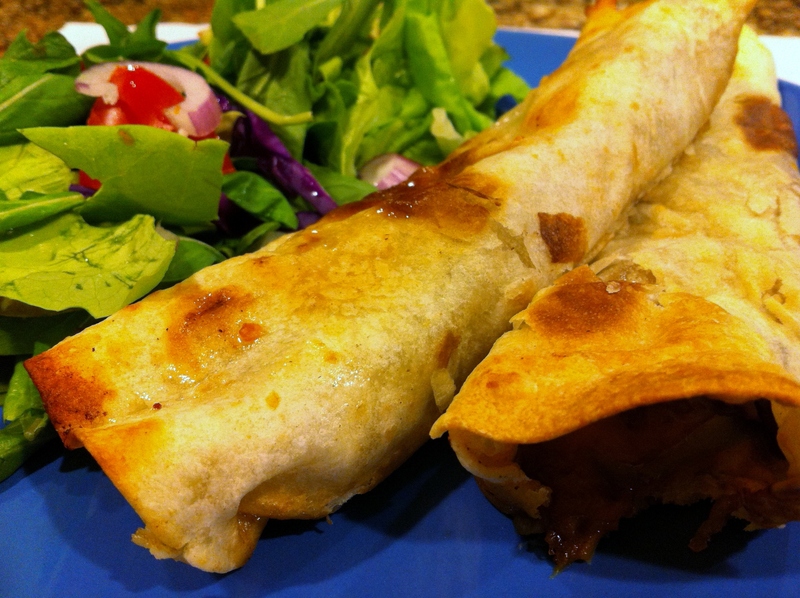 Using a pastry brush, moisten the under and top side of each rolled tortilla. Bake in a 450 degree oven for 20 minutes or until tortillas reach desired crispness. Serve with salsa, sour cream, guacamole and salad. Liz Note: The tortillas I had were quite small for rolling these correctly. 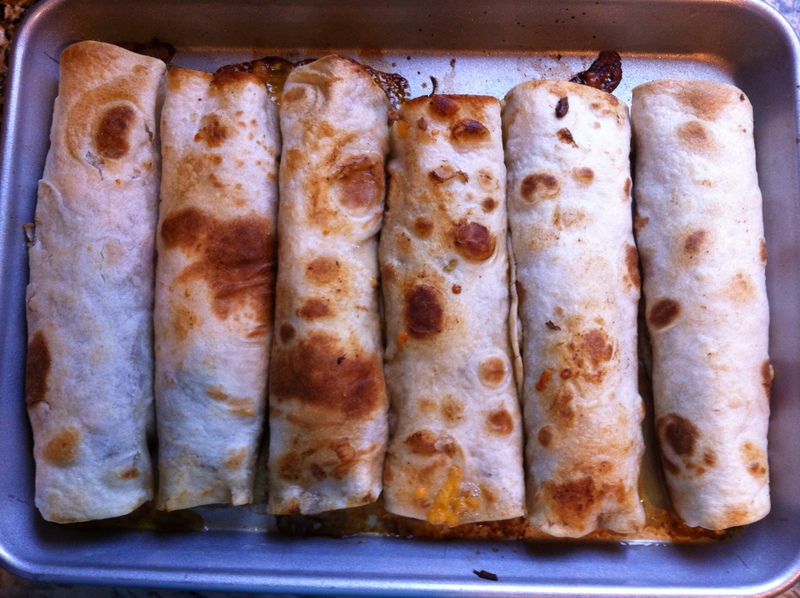 To be honest, these look more like burritos! I’ll take a new photo once I get larger tortillas. But for now, this will have to do! Also, let’s be real, anything deep fried tastes amazing. But, this method does work and is so much better for you. Try it and see what you think. Delicious food with no (well not much) guilt! Awesome post……bam it’s great…..I want to try those tortillas!